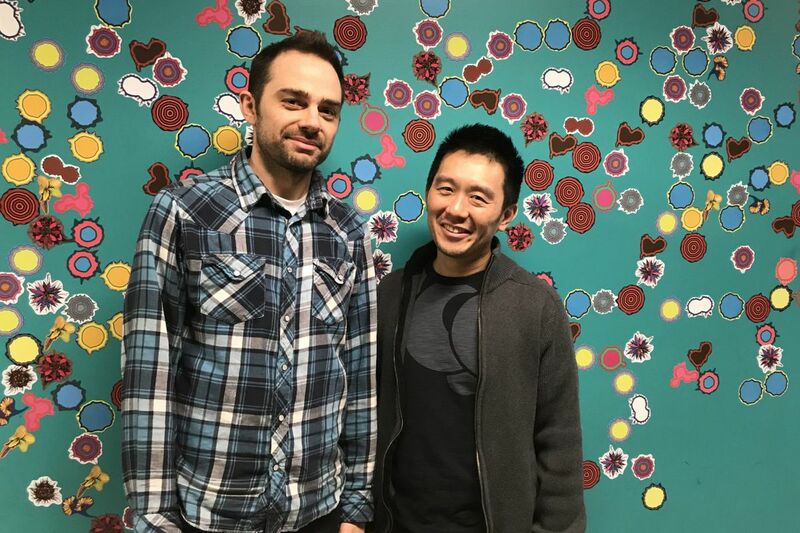 Hip-hop lyricist Aaron Jafferis and composer Byron Au Yong, the creative team behind 'Activist Songbook,' the interactive theater piece that will be performed at sites around Philadelphia from May 3 to May 6 as part of the Asian Arts Initiative's 25th anniversary celebration. Byron Au Yong and Aaron Jafferis' Activist Songbook was inspired by the racially motivated 1982 murder of Vincent Chin, a Chinese American man who was beaten to death in the Detroit suburb of Highland Park at a time when Japanese automakers were believed to be taking American jobs. The unconventional production, part of the Philadelphia Asian Arts Initiative's 25th anniversary celebration, will happen this weekend not in a theater but in pop-up performances and exhibition spaces throughout the weekend, and even on buses transporting audiences between those venues. It's the third teaming of Au Yong, a San Francisco avant-garde composer, and Jafferis, a hip-hop poet in New Haven, Conn. Each of the duo's previous theater productions focused on media frenzies that sprang up around Asian American men. 2013's Stuck Elevator, a "comic rap scrap-metal opera" is about a Chinese food deliveryman stuck in an elevator for 81 hours; (Be)longing, from 2015, is a hip-hop oratorio about the 2007 mass shooting at Virginia Tech. Au Yong says he thinks of the subtitle for Songbook as "To Counteract Hate." When Au Yong and Jafferis came to town in October to start work on Songbook, they began by interviewing community activists and organizers around Philadelphia. "We try to create some sort of dialogue to create social change with our shows," Jafferis said in an interview in March at the AAI headquarters on Vine Street, where he and Au Yong were workshopping Activist Songbook with singers. "And we realized that the people that were most changed by these shows were us, the participants and creators." That realization dovetailed with the ideas of the late Brazilian dramatist Augusto Boal, who created the Theatre of the Oppressed, and "talked about turning 'spectators in to spect-actors,' " says Jafferis. "So with this piece we're taking it even further. We interviewed Asian American activists and organizers in Philadelphia and asked them how we could make art that would be useful to them –"
"And not one of them said, 'Make a theater production!' " Au Yong said with a laugh. Instead, Jafferis says, "People talked about a 'Know Your Rights' rap, so people could know what to do when ICE comes comes to your door. Or new or fresher songs and chants to be created for rallies, or songs that would help people endure long sit-ins." The idea is that the Activist songs — which everyone will be invited to join in on and sing throughout the weekend, with lyrics and sheet music provided — will remain useful long after this weekend's performances. Activist Songbook is "definitely not conventional theater," says Gayle Isa, Asian Art's executive director, who is ending her tenure this year after a quarter-century with the arts organization. "It's going to be a pretty great experience." Isa says she was impressed by the humor and the storytelling in Stuck Elevator, and also by Turbine, Au Yong's teaming in Philadelphia with the Mendelssohn Club and Leah Stein Dance Company that was dramatically staged at the Fairmount Water Works in 2015. Inquirer classical music critic David Patrick Stearns praised Au Yong's "graceful melodies" and said "it's hard to imagine anyone walking away from Turbine unchanged." "Having had a chance to witness the way that Byron works," Isa said, "we were literally brainstorming hundreds of artists who we had worked with or wished we had worked with. He was on top of the list." The Asian Arts weekend celebration will include works in various media. Sueyeun Juliette Lee's timely Peace Light lantern and sculpture installation will explore relations on the Korean peninsula, along with a performance by choreographer Jungwoong Kim in Chinatown. Filmmaker Rea Tajiri will show her projection-based work in West Philadelphia, about the resettlement of Japanese Americans in World War II. Activist Songbook will also go mobile, being presented in several pop-up performances lasting 10 minutes or less throughout the weekend. Performers will break out in song when crowds are gathered for other performances and exhibitions, or while audiences are being transported across town. When Au Yong and Jafferis huddled with organizers, they gathered info about conflicts that have galvanized the Asian American community in Philadelphia through the decades. The rallying against the building of the Vine Street Expressway in the 1970s inspired the song "Urban Renewal," which resonates with gentrification issues today. "We Will Not Be Silent" arose out of talking with Asian students who endured racially motivated violence at South Philadelphia High School in 2009, and is newly relevant at a time "when the country is increasingly xenophobic," Au Yong says. That makes it a particularly apt time to tell the story of Chin, who died four days after he was beaten with a baseball bat while leaving his own bachelor party. His white assailants pleaded to manslaughter and were sentenced to three years of probation and fined $3,000. "Vincent Chin is so important historically for Asian American organizing and for antihate crime organizing," says Au Yong, who teaches music at the University of San Francisco. "And yet young people don't know who he is." Au Yong and Jafferis, who is white, have been working together regularly since they met in a theater program at New York University in the early aughts. "Byron and I started collaborating because we were interested in the same issues — issues of isolation and belonging and equity and how things are translated to each other and what is lost in translation." Jafferis started thinking about those issues, he said "growing up as the only white boy in a black school" in New Haven, a city with a rich theater tradition, with Yale University, and "where the racial and economic inequality is particularly visible." Working with Au Yong, he says, "gave me this fresh lens that I could look at myself and my city that was like a third way that broke down some boxes that I had put some people and myself in. Plus, I really love working with Byron. His music is simultaneously popular and challenging." "Aaron and I are a good team," says Au Yong, who grew up a theater kid and a would-be classical pianist in a Chinese American family in Seattle. "I was in anything that would cast an Asian kid: The King & I, South Pacific, an orphan in Oliver!" "We hold really similar values but come from different aesthetics. So we can challenge each other with different ideas artistically and really about what something means." The Philadelphia performance of Activist Songbook — which will begin at 4:30 p.m. Thursday on the Asian Arts' guided bus tour, which leaves from the Vine Street offices to head to other exhibition sites throughout the city — is only the beginning of a planned two-years-plus process for the project. "This is the first iteration of what we're going to be doing around the country through the next presidential election on Nov. 3, 2020," says Jafferis. Future sites for new songs to be written in conjunction with local communities potentially include San Francisco, Seattle, and Detroit, a city geographically connected not only by Vincent Chin but also by Grace Lee Boggs, the prominent feminist activist who was based there and died in 2015 at 100. So far, the Activist Songbook consists of nine songs, which will be sung throughout this weekend. But by the time the project is finished in 2020, the aim is for there to be 53. "It's pretty random. Byron likes odd numbers," says Jafferis. "Maybe a deck of cards, plus one joker."